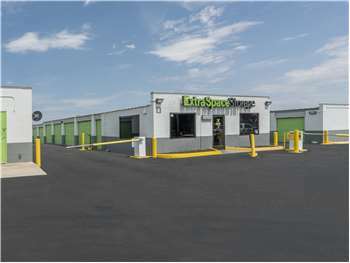 Located on Airport Dr NW off Central Ave NW and Bataan Dr NW, Extra Space Storage serves Albuquerque residents near West Mesa and South Valley. Locals will recognize our facility near Legacy Church behind Smith's. We're also accessible for residents of nearby apartments, such as Dynasty West Apartments, Agua Azul Apartments, Bluewater Village Apartments, Sandia Valley Apartments, and more! With a large selection of storage units, vehicle storage, and exceptional security, Extra Space Storage on Airport Dr NW can handle both residential and commercial storage needs in Albuquerque! Our Albuquerque storage facility has the space you're looking for! We offer units as small as 5x5 and as large as 20x20 with features like indoor access, first-floor access, and drive-up access. I've been using Extra Space on and off for 15 years and continuously for the last 5 years. I've used 3 different locations in Albuquerque and Santa Fe. I have tried large and small, outdoors and indoor units. I always experience excellent customer service in person and on the phone. The staff has always been flexible when I need to submit my insurance paperwork, and always forthcoming with important information about payment deadlines, moving and out and anything I need to know. Moving is hard and I get very dirty and tired, and they understand that, and are still helpful. I've seen them treat others with respect and kindness regardless of the time of day and their state of exhaustion. The facility is always very clean, the website is easy to use and the prices are reasonable. My first choice. I am fairly new to ESS, as I have only been a tennent here since mid-November. I am NOT however new to the "storage scene" as I have had to rent units in 3 other facilities in the past. I have been extremely satisfied with ESS in every possible way! The until is the average size I've rented in the past but significantly cheaper. The management is friendly and always very helpful and caring. I have, in the past, dealt with management that has cut my lock because they mixed up their records. They thought my unit belonged to a delinquent account. It was nearly a WEEK that my stuff wasn't secured before I was even notified...then forced to pay an additional "new lock" fee for their mistake. ESS however immediately noticed when I hadn't closed my unit correctly and after THEY secured it tried for two weeks to contact me. I coiukldnt have been more greatful knowing that my stuff was safe and secured!! Thank u Extra Space Storage! The facility seems fine but email statements for payment due didn't come thru, resulting in a $10 fee that the facility manager was unable or unwilling to overturn. All I got was a 'payment past due' statement emailed, which is not acceptable business practice. I Have had a storage unit 2 years and instead of keeping the price the same or close to it it has doubled!! They claimed to have security on site. Which I have never seen. What is the point of raising prices on stuff sitting in an outdoor box. It doesn't cost them anything. Storage units do not use water, utilities, sewage, parking space. I will be moving everything out before December 2013. My suggestion is to go with a local company. My sister has had a unit and the price has never changed in 5 years. AVOID EXTRA SPACE STORAGE AND SAVE SOME MONEY. It's hassle-free, quiet, and clean. The staff is friendly. I enjoy storing my things here. Drive north on NM-45/Coors Blvd. Turn left onto Airport Dr SW. Turn right onto Central Ave SW. Turn left onto Airport Dr. Our facility will be on the right. Drive southwest on Central Ave/Route 66. Pass Walgreens then turn left onto Airport Dr. Our facility will be on the right. Drive east on Central Ave/Route 66. Pass Verizon and turn left onto Airport Dr. Our facility will be on the right.